This match was one of differences, swings and shifts of momentum, and in general, it was just much more fun than our other matches this week. In some matches, we played some our best tennis of the season. In others, we found ourselves in difficult positions because of our opponent or because of our nervousness, or both. Both of those situations, playing our best and struggling through, offer us great chances to learn. 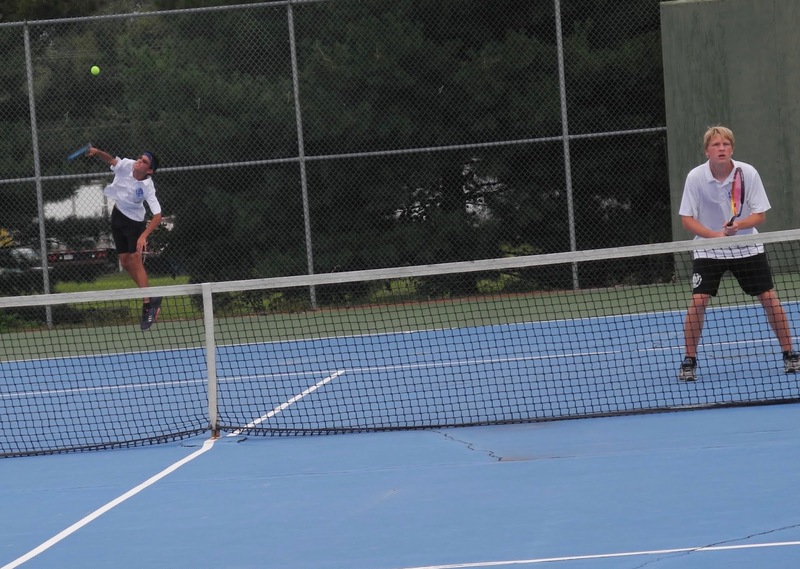 At #1D, Jonah and Nathan put together one of their most complete matches of the season. Both players were at the top of their games, playing the net well and keeping points alive from the baseline. I can't count the number of times they escaped pressure with a well timed lob, or created pressure by making a simple shot and pushing forward to the net. I feel like of any of our positions, this team has taken early difficult matches and used them to get better. This match was really impressive. It was even more fun to watch the way it ended, with Jonah popping over a volley and then setting himself up for a simple overhead smash. Another position that was at its best today was #3S. Braden Bohn picked up his first varsity victory of the year, and he did it by playing his best tennis. That included confident forehands and backhands and some really good and consistent serving. Of course, that all didn't start happening until after Braden was down 4-2 in the first set. 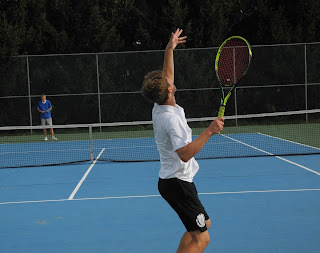 Braden was simply being a little bit too impatient, and he couldn't get a good rhythm in the match against his consistent opponent's looped shots. But from that point, Braden got into it. He went on to win 10 of the next 11 games, taking the first set 6-4 and then the second 6-1. It was really good tennis. A couple of our other positions started that way. 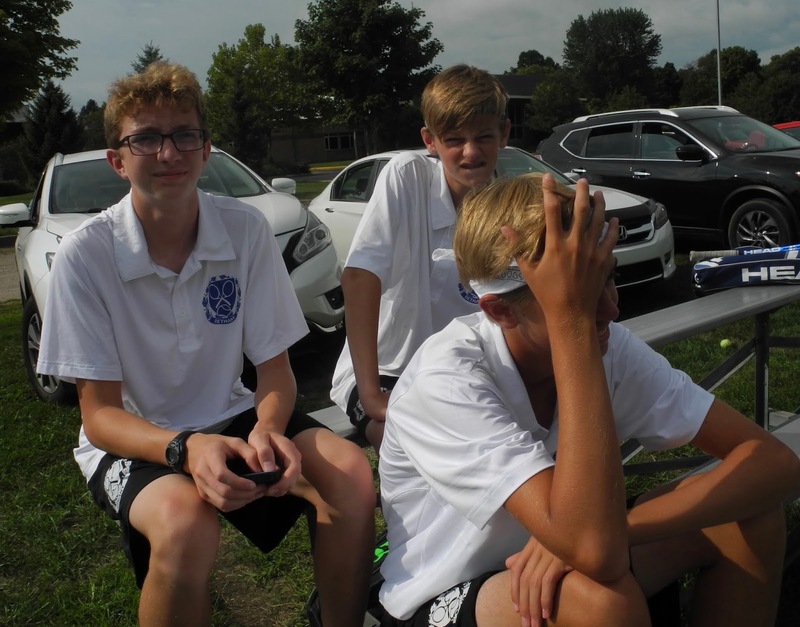 Both Liam at #1S and Will and Tyson at #2D started out with dominant, confident tennis. They played with energy and movement. They played with belief. Liam covered the short balls and controlled points with his forehand. Will and Tyson struck great returns and dominated the net. Both positions sailed to easy first sets. But the second sets were much different. opponent reminded him of Liam from last year. And that was exactly right. Liam had to keep his energy up and run down some more balls, but in the second set that didn't happen. Liam lost his weapon as well, sending too many shots spinning into the net. Moving into a third set, Liam regrouped and found his way to attack - moving his opponent around. Last year, Liam may not have been able to recover, but this year he trusted his strength. Soon, he found gaps and hit through them for the win. #2D took a 5-2 lead in the second set and looked as if they were cruising for an easy victory. But, no, storming back came the Trojans. They broke Will's serve. Held. Broke Tyson's serve. Suddenly it was 5-5. In these games, the Bruins were tentative and not smart about their plan. The Trojans took advantage of both. Will and Tyson took the lead again at 6-5 and Will was going to serve for the match. We took a 40-15 lead and had 2 match points. The first saw the Trojans smack a winner up the line, a really nice shot. On the next, Will served and volleyed, and the ball sat up for a putaway. But Will hit it in the net. Disappointed, the next two points went to Triton, and #2D went to a tiebreak. I was worried, but gave them the encouragement and focus I thought we might need. All we can control is attitude, effort and plan. And boy, did Will and Tyson respond. After losing the first point, the #2D Bruins won six straight points. Many of these were behind really good serving from the guys, especially from Will. We also had two net points that we were able to win. At 6-1, we hit two returns into the net. But leading 6-3, Tyson hit an excellent curving "slider" serve, which forced a return error. This never-say-die, comeback-from-disappointment attitude was awesome to see. It should bring Will and Tyson a lot of confidence. They faced down struggles, and they succeeded. Another position of facing down struggles was #3S. Philip seemed a bit low on energy, and his opponent really put the pressure on Philip, often attacking the net or finding other ways to make Philip's shots seem to mean more. Philip definitely didn't have his "A" game, but he never gave in. 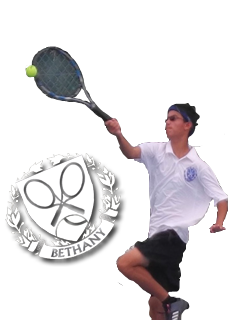 The match was decided by one break in each set, Philip making his Triton opponent earn each point. But in the end, junior Jared Bules did earn the victory. So, it was a day of facing challenges, mostly succeeding. Let's file this response in our brains and allow it to encourage us to swing freely in other situations like this. This was the same as the varsity match. Some great play, some facing our weaknesses. At #1S, Josh Cartwright played great. He started out down and not able to match the pace of his senior opponent's serve. But soon, he found that hitting his topspin forehand deeper put more pressure on his opponent. As Josh switched to this more neutral ball, his opponent had trouble keeping the ball in. And Josh got an excellent victory. #2S, Matthew Dyck did it again. He got himself into a pressure situation but delivered the win with his signature stroke. Early in the match, he found his forehand not working too well. It drifted long too often. So we slowed it down, increased the spin, and Matthew picked up his determination. He was able to run so many balls down and hit some great deep forehands. Despite trailing 5-3, Matthew recovered to take an 8-6 win. #1D played excellent tennis as well. They served well and volleyed well and just played solid. In fact, they were probably the only team on the day to have a pretty even and consistent match. They just fine for the whole match. It was awesome to listen to Theo and Jospeh encourage each other though. I love it when doubles team are really "in it" together. Jim played #3S, and just couldn't hold serve. When he'd get them in, he'd win the rallies. If he missed, well, then the point didn't even get started. Austin and Chris experienced a similar thing at #2D. Both positions never held serve... but broke almost every time. So, we have our plan, we know the weaknesses we need to change. Not just work on, but things where we need to make significant change. I can't wait to get on that! It was enough to grit it out. Sometimes, we want to play our prettiest tennis all the time. We expect that every stroke will be just like we practiced it. Everything will go as we want. But that's not reality, not even possible. It is enough to stick with it in matches like that, to figure out ways to make it work. That was enough today. So much was weird this week. Teams with only 5 players, JV matches against each other, long nights getting ready for a special benefit concert, opponents that didn't offer much resistance, weather that was frustrating to play in, weather that we couldn't play in, a match on Labor Day weekend with a morning start time. Through all that, you stuck together. You watched US Open in my room at lunch, during rain outs, or while waiting. You played spur of the moment matches because another team didn't have enough to play us. And so much more. You do it for each other because you are brothers. - the first half of the season. - all that we have learned in our losses. - all that we are learning by winning close ones. - the way that we believed in ourselves when things got tight. - how Tyson and Will jumped out to a 6-1 tiebreak lead. - Joseph and Theo and their energy together. - Chris and Austin trying to make things work. - Matthew's continual calm under pressure. - Liam's excellence in 3rd sets. - God's grace and peace. Lord God, we are at the mid-point of our competition season. We are not completely satisfied about where we are, how we hit, how we've played - but we are learning to be at peace with the way You've created us and how important we are to You. Give us the perspective of Your love. Help us to see each other as You do. Help us to see ourselves as You do. In Jesus name, amen!